What? You've never heard of The C.S. 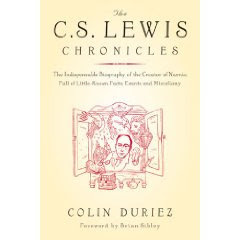 Lewis Chronicles : The Indispensable Biography of the Creator of Narnia? Well neither had I until very recently. I stumbled across it and I've seldom been more grateful. Published by BlueBridge Books and written by Colin Duriez, (who I looked up and discovered has written a vast collection of book titles I am incredibly interested in), this book is filled with lots of tidbits of random (and otherwise) information about Lewis. (I'll remind you that Lewis is my favorite author of all times which is 1.) why my two sons are named after him (that'll keep you guessing!) and 2. why I'm hosting the Chronicles of Narnia Reading Challenge. Admirable man, wonderful writing. How can one possibly go wrong? I devoured The C.S. Lewis Chronicles in less time than it will likely take you to read my review of it. I absolutely loved it. Duriez provides so much information that I hadn't heard or seen before and lays it out in chronological order so that you can get a good idea of what was happening in the world along with significant events in Lewis' life. The C.S. Lewis Chronicles is filled with little snippets from his parents letters, his brother's journals and from correspondence with friends such as J.R.R. Tolkien. It's a treasure trove of facts on the man behind The Chronicles of Narnia and I would say that this book is not to be missed. I'm showing you a short list of his reading. This, however, is not his life's reading list. The partial reading list you see above is his list from when he was sixteen years old. It's no wonder he was a brilliant writer. He was a diligent and studious reader. I have much to learn. This has nothing to do with your post. :-) I just finished The Blue Castle on our trip this last weekend. I really enjoyed it. Is the story true or partly true? Now on to reading more of her books! Wow!! Looks like a great book. You'll be happy to know that as I type my husband is beginning The Lion, the Witch and the Wardrobe with my kids. :) And so it begins. This looks like a fantastic and fun resource, Carrie. Thanks for sharing it! Like Stephanie (the Mommy Brain one, not the Olive Tree one), my children are also now enjoying Wardrobe. Oh, well, Jack and Lewis are nice names, too.